Hard to choose which one to build! Although only approximately 150 examples were built, the Sopwith Triplane achieved lasting fame for its outstanding manoeuvrability and phenomenal rate of climb (for 1916). The Germans were also deeply impressed. After carefully evaluating several captured examples, Idflieg encouraged German manufacturers to copy the design, resulting eventually in Fokker’s iconic Dr.1 Triplane (there is no record of the two types meeting in combat however). It has long been a favourite with modellers and so Roden’s kit in the popular 1/32 scale will be warmly welcomed. 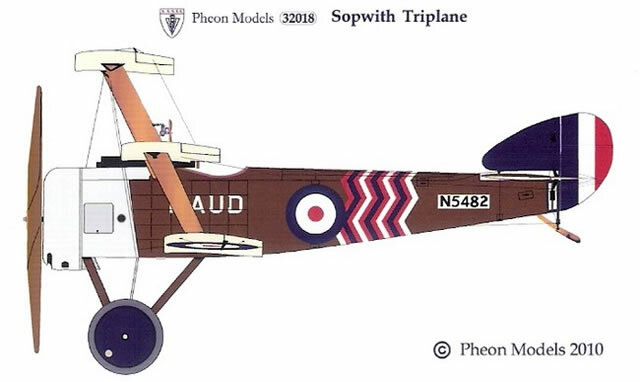 Pheon produced a very comprehensive set of decals for the Sopwith Triplane in 1/72 and 1/48 scales back in January this year, so when Roden announced their 1/32 scale Sopwith Triplane kit, all the research and design work was already done. 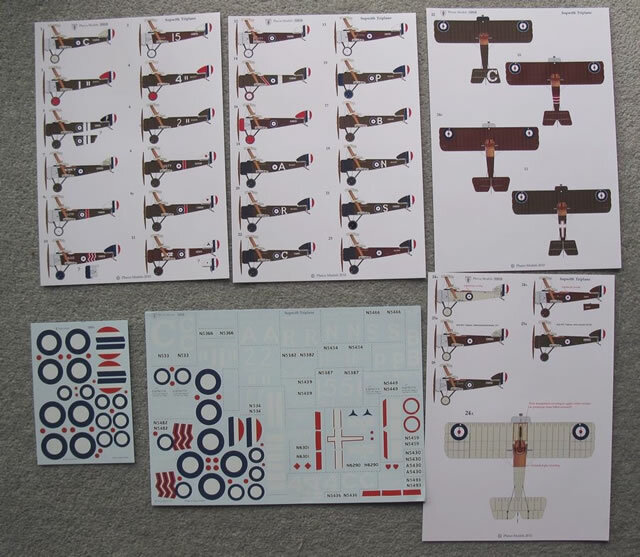 The decals have been released before their intended kit has reached the market – is that a first I wonder? 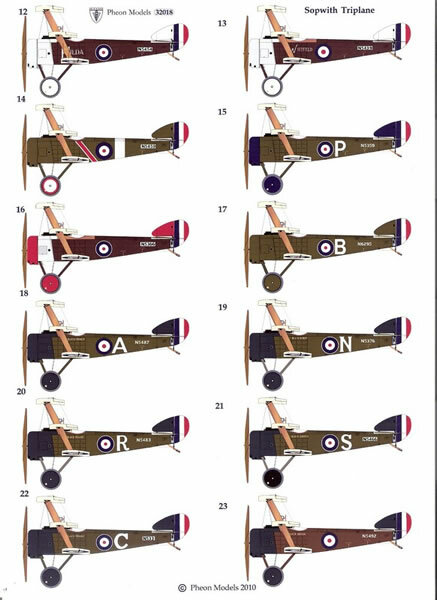 Modellers will be stuck for choice as this is a very comprehensive set with markings for *27* different aircraft. The RNAS permitted their pilots greater latitude with individual markings, so the options are rather more interesting than on many RFC aircraft. 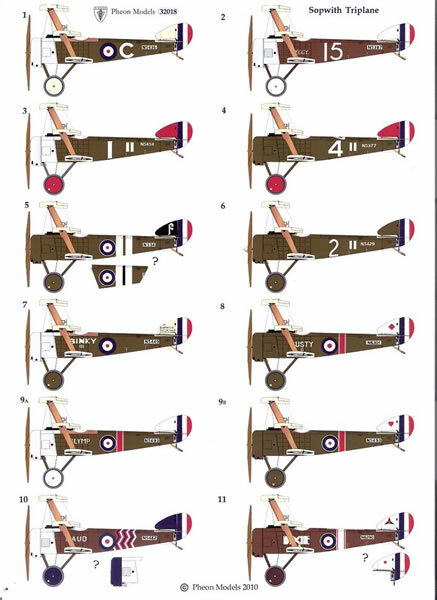 There are a good variety of famous Triplane aces in the set: FSL Ray Collishaw (60 victories), FSL R A Little (47 victories), Flt Cdr Rod Dallas (32 victories), Flt Cdr C D Booker (29 victories), FSL W M Alexander (22 victories), F/L R Minifie (21 victories). There is also a good selection of nationalities with 6 Canadians, 3 Brits, 3 Australians, 1 New Zealander (good on you Rowan), and an American. Most Triplanes were operated by Naval 1, 8 and 10 Squadrons, attached to the RFC and each of these are well represented with respectively 6, 7 and 9 aircraft from each squadron, including all the famous ‘Black Flight’. Two versions of the rare two gun Triplanes are in the set (only six were originally built). 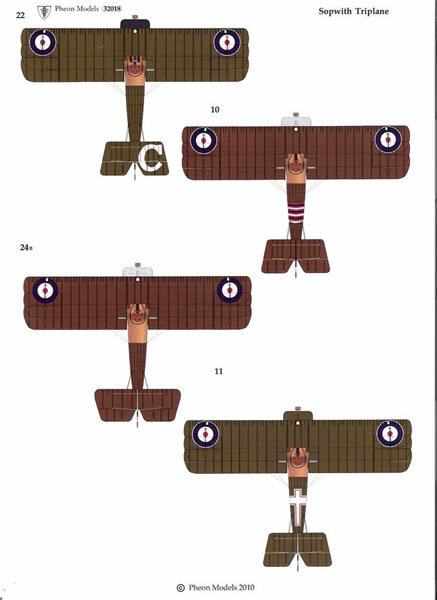 Two versions of the prototype are there, plus two versions of the sole RFC Triplane and even a Home Defense from the Manston War Flight ‘The Ooslumburd’ which flew anti-Gotha patrols. The Roden kit comes with five different markings options but as my kit has not arrived in the mail yet I cannot comment further. What I can say is that Pheon decals are excellent to apply, they are thin, have minimal clear film and respond well to Micro Sol softening solution. A set of 1/32 scale plans (emailed separately to customers who received the first sets sold). There are a couple of little production errors that Pheon identified after the printing run had been finished. These have been corrected with replacement decals included in the bag. Only one set of national markings come with the set as Pheon believe it was more advantageous for modellers to have more options than additional national markings. 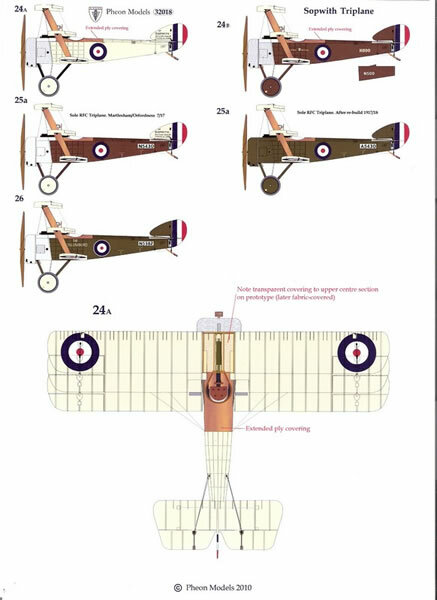 However, for those modellers wanting to complete additional kits Pheon are selling separate sets of national markings (only) for the Sopwith Triplane (#32018a, price £4.50) which has cockades and rudder stripes for two aircraft. 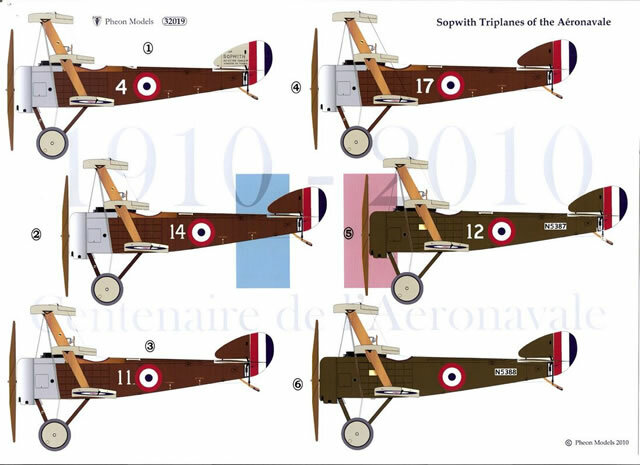 It is much less well known that the French Naval Air Department also operated a small number of Sopwith Triplanes in conjunction with SPAD VIIs and Nieuport 17s from their base at St Pol. 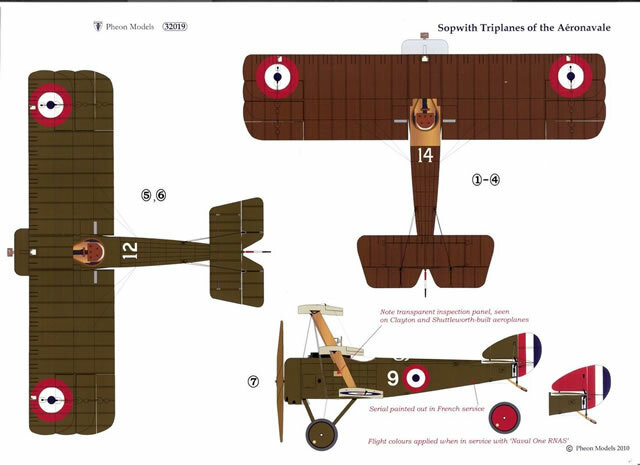 To commemorate the centennial year of the Aéronavale, and to complete their thorough coverage of the Triplane, Pheon have released a separate decal sheet with markings for seven French Triplanes (out of the fifteen that served). 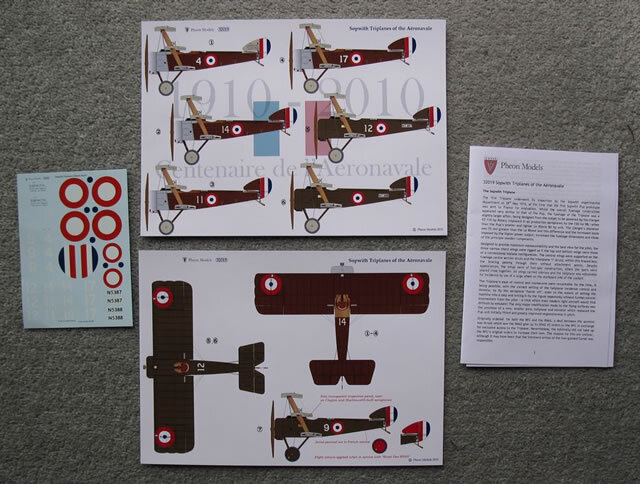 I expect this release will appeal mainly to modellers with a French connection as, unlike the RNAS machines, the markings on the French aircraft are rather plain. The price for this set is much lower, £6.50 and it comes with two pages of full colour artwork. This is an outstanding decal sheet considering the breadth of its coverage, the research and the quality of the decals, artwork and plans. Ordering is via email to mailto:pheon.models@hotmail.co.uk.